Do you love Danish pastries and cake? Fruit Cheese Coffee Cake is a delightful mash-up of the two. This coffee cake is a snap to put together, using basic cake ingredients and canned pie filling for the fruit layer. This might just be the best coffee cake you’ve ever tasted! 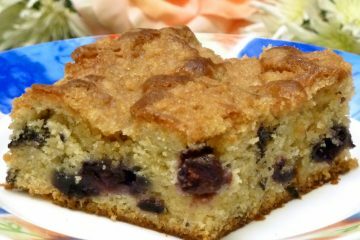 This version of blueberry buckle coffee cake is enriched with sour cream and white chocolate chips. Very easy to make with simple ingredients. Looking for a decadent dessert, but short on time? This Shortcut Turtle Cake will do the trick. It begins with a cake mix to save time, but your thankful guests will never believe you didn’t start from scratch. Fresh Strawberry Cake is an elegant way to make use of gorgeous fresh strawberries. This Bundt cake is delicious, easy to make, and pretty to the eye. Cherry Blueberry Streusel Bundt Cake combines two different fruits in separate layers with a strata of delicious pecan streusel in the center. Instead of baking each layer separately and building a cake, it is baked all at once in a Bundt pan.